Hamsa protection amulet, Hand of Fatima charm against the Evil Eye, good luck talisman, hammered and oxidised brass, unisex amulet necklace. Hamsa, Khamsa, Hand of Fatima, Hand of Mary, Hand of Miriam… just a few of the names given to this ancient symbol of protection and good luck… predating Christianity, Islam and Judaism it has often been associated with the divine feminine and remains to this day a very popular amulet and talisman for both men and women. Cut from sheet brass, textured and oxidised and then sealed with microcrystalline wax this Hamsa hangs from an 20 inch (51 cm) antique bronze colour chain that closes with a lobster clasp… different lengths chains are also possible just leave a message in the 'Note to Seller' field at checkout. Faceted amethyst nugget wire wrapped in oxidised brass, pendant necklace, February birthstone, Magick amulet, lavender violet. Aventurine necklace - faceted briolette pendant - apple green gemstone - wire wrapped - oxidised brass - good luck talisman. Lunar phase necklace in mixed metals, silver, brass and copper, hammered and fire oxidised for a rainbow patina. Triangle earrings, geometric earrings, citrine earrings, chain fringe, chandelier earrings, oxidised brass and gemstone earrings. The Black Pearl… hammered and oxidised copper with large black freshwater pearls and angular antiqued silver ear wires. 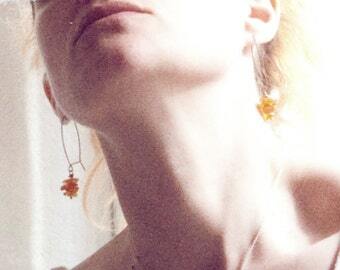 Jewelry from this shop is so mesmerizing. It keeps me coming back again and again. This piece is beautiful. Thank you! 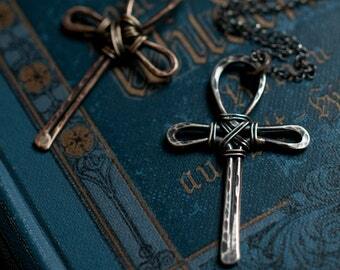 Orthoceras fossil necklace, long dagger necklace, oxidised brass, Akasha talisman, energy amplifier, eternity symbol. 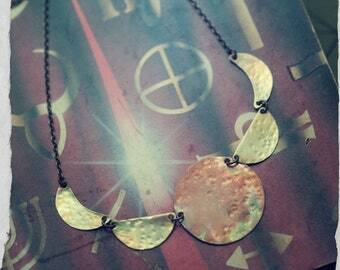 Moon phase necklace, lunar cycle, mixed metal, copper and brass, hammered and fire oxidised for a rainbow patina. Ankh necklace, wire wrapped, hammered and oxidised brass or sterling silver Ankh pendant, boho necklace, Egyptian talisman, ancient amulet. 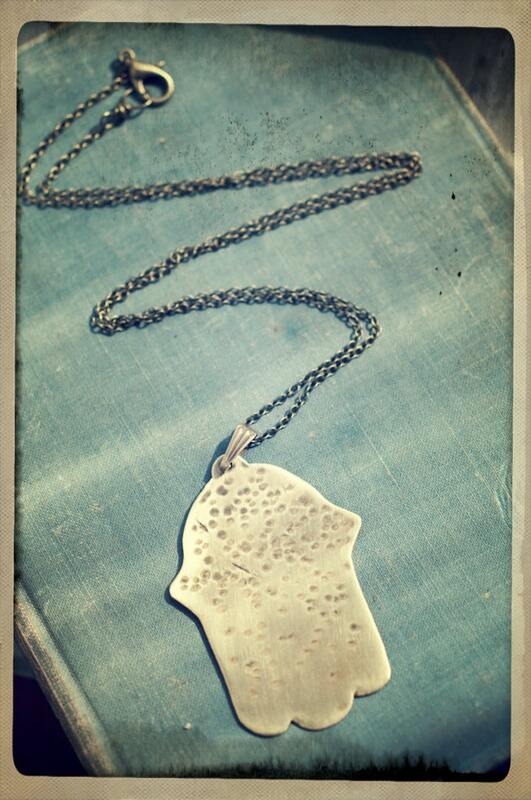 Copper arrowhead protection amulet, fire oxidised and purified with hammered texture and aged brass chain. 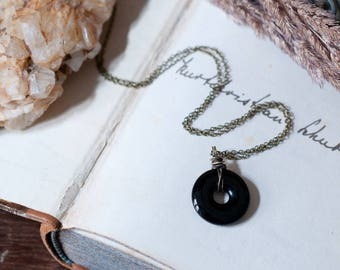 Onyx pendant necklace, black gemstone donut, oxidised sterling silver or brass, wire wrapped, natural amulet, inner strength and protection.